In 1931, the second year of the Great Depression, Newark's homeless were being allowed to sleep in the cells of Newark's police precincts, ground was broken on Broadway for a new home for the New Jersey Historical Society, and at 744 Broad Street, an architectural jewel was opened for business as the "National Newark and Essex Bank Building." The new skyscraper, started a year earlier, towered 465 feet above Broad Street and contained 35 floors. Its opening made it both New Jersey's and Newark's tallest commercial tower. The building exterior was of tan brick and limestone. The top was modeled after the mausoleum of Halicarnassus, one of the seven wonders of the world. Its mezzanine was decorated with ten murals by J. Monroe Hewlett and Charles Gulbrandsen and depicted the growth of commerce in Newark. The architects of the steel-framed structure were a father and son, Wilson and John Ely, who had earlier designed Newark's City Hall building and the American Insurance Building. Almost from its inception, the building housed New Jersey's most prestigious legal, political and business firms. Everyone who was anyone had an office at 744 Broad. The building was also home to the exclusive 744 Broad Street Club, a private dining club of prominent bankers, attorneys, politicians and businessmen from all over New Jersey. In its heyday, nearly 80 percent of the tenants in the 744 Building were lawyers and law firms. Many of the State's present-day law firms had their roots in that building. In its prime years, rumor had it that 744 Broad Street housed more lawyers than all the rest of the state combined, according to one attorney who worked in the building from 1959 to 1985. It was of course a slight exaggeration, but it was the home of many of New Jersey's largest law firms. The late and great Supreme Court Justice, William J. Brennan, Jr., had his law offices in the building in the late 1930s and early 1940s. He was appointed to the New Jersey Superior Court by Governor Alfred Driscoll in 1951, and left to join the Supreme Court in 1956 after being appointed by President Dwight Eisenhower. With 744 Broad Street as the city's premier legal address, there were so many lawyers in the building that visiting an adversary's office usually meant taking a ride in an elevator. Many cases were settled over lunch in the 13th floor dining room, or in the lobby while waiting for a lift upstairs. The lobby was ever alive with lawyers toting bulging briefcases in the hallways and on the elevators. In a Star-Ledger article on October 14, 1997, Seena Stein, president of a Rutherford real estate brokerage, was quoted as saying of the 744 Building, Every important lawyer in the State of New Jersey was in that building...It was the queen building of all Newark." In addition to its legal residents, it also housed the offices of Newark's professional elite, and had a number of private dining clubs. Following the general decline of Downtown Newark during the 1980s and 1990s, the 744 Building fell on hard times. All the largest law firms departed. The dining club closed. Much of the 744 Building's decline was related to the threat of crime in Downtown Newark. Another contributing factor was the poor maintenance of the building while it was under the ownership of Helmsley-Spear Inc., the real estate development firm of the late Harry Helmsley and his wife, Leona. The fear of crime drove many of the 744 Building tenants to the suburbs, or to the Gateway Complex, with its accessibility to the nearby Pennsylvania Railroad Station. "Just a few years ago, as car thefts and violent crime raged in Newark, the streets of downtown were considered a dangerous place, especially after dark. "Most downtown businesses are shuttered by 6 P.M." The article went on to add that in the two years up to 1998, crime was down 25 percent and NJPAC (The New Jersey Performing Arts Center) was fast remaking downtown Newark's image. 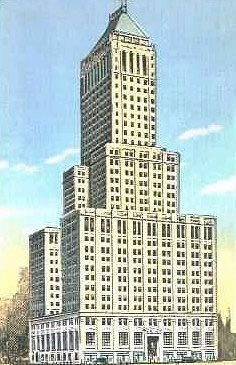 By 1990, the 744 Building was described in the Third Edition of the classic book titled "Newark" by John T. Cunningham as one of "the world's tallest white elephants." Cunningham wrote that talk of demolishing the tower was noised about but explosives never touched the structure. He said what the building needed was a new owner with a large purse and strong faith that the tower could be transformed into a sound investment. The beginning of the rebirth of the 744 Building, now referred to as the "National Newark Building" began in November 1997 when the Helmsley estate sold the 744 Broad Street building to Cogswell Realty Group, which announced that it would restore and reconstitute the building to its former glory. The end result was a $55 million total renovation of the building and the integration of 21st century technologies that converted the building into an ideal and inviting modern office environment. Among the new improvements were 1,500 new openable thermal windows, 15 high speed elevators, removal of the escalators, and the lobby given a complete facelift with restored 25 feet high plaster ceilings and grand chandeliers. The classical style facade in the lobby was scrubbed and repainted and the art deco interior and giant mezzanine level murals restored. The restored building slowly has been regaining its earlier popularity and has been referred to as the "crown jewel of Newark's renaissance." The building toady is an elegant high-tech office tower that is attracting blue ribbon tenants, even from across the Hudson River. The restored building still holds special appeal for attorneys, as well. One attorney who moved in recently, said "You can even open the windows. You don't get a modern building where you can open a window. Another recent new tenant, also an attorney, said of the building's facelift: "Its gorgeous! The building has a lot of character." The retrofitted 744 Building was virtually taken apart and replaced. All of the work done while the building was tenanted and was kept fully functioning during the process. Today, the building, which had fallen to 19 percent occupancy, is more than 80 percent occupied. Several full-floor tenants in the rebuilt building include the legal publisher Matthew Bender, who occupies the seventh, eighth, and ninth floors...Broadview Networks on the tenth floor...Regional Business Partnerships on the 27th and 28th floors...Hiller Architects on the 29th and 30th floors, Mintz Lighting on the 25th floor, and the Newark Sports Authority on the 33rd floor. Today's tenancy, unlike earlier years as mainly a legal building, today enjoys a mix of architects, attorneys, technology companies, and communications firms...even a pre-eminent legal publisher. The building is extremely well maintained and contains all the latest 21st century technologies. Newark Mayor Sharpe James, in his 2002 State of the City address, at the outset of 2003, saluted Arthur Stern, CEO of Cogswell Realty on the restoration. Said Mayor James: "Under his leadership, Cogswell took the old National Newark Building at 744 Broad Street and transformed it into a gorgeous commercial showpiece, recapturing its former glamour and former status. 744 Broad is now the address to have in Newark." Today brilliant lighting from the roof casts a glow over Newark's skyline by night making it visible from miles away. By day, Newark's largest flag flies from a staff high above the roof, serving the same function. Before its return, the flag had been missing from the roof for 30 years.